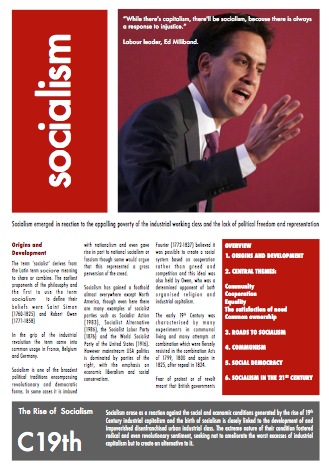 The term ‘socialist’ derives from the Latin term sociare meaning to share or combine. In the grip of the industrial revolution the term came into common usage in France, Belgium and Germany. Socialism is one of the broadest political traditions encompassing revolutionary and democratic forms. In some cases it is imbued with nationalism and even gave rise in part to national socialism or fascism though some would argue that this represented a gross perversion of the creed. and the World Socialist Party of the United States (1916). However mainstream USA politics is dominated by parties of the right, with the emphasis on economic liberalism and social conservatism. Socialism arose as a reaction against the social and economic conditions generated by the rise of 19th Century industrial capitalism and the birth of socialism is closely linked to the development of and impoverished disenfranchised urban industrial class. The extreme nature of their condition fostered radical and even revolutionary sentiment, seeking not to ameliorate the worst excesses of industrial capitalism but to create an alternative to it. 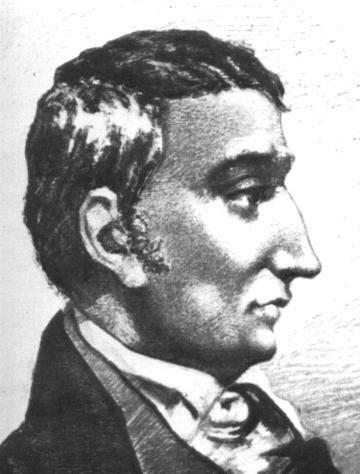 Fourier (1772-1837) believed it was possible to create a social system based on cooperation rather than greed and competition and this ideal was also held by Owen, who was a determined opponent of both organised religion and industrial capitalism. The early 19th Century was characterised by many experiments in communal living and many attempts at combination which were fiercely resisted in the combination Acts of 1799, 1800 and again in 1825, after repeal in 1824. Fear of protest or of revolt meant that British governments all took a hard line against any attempts at cooperativism, syndicalism or combination. In 1820 six acts were passed with a wide range of oppressive measures governing, assembly, sedition, combination or even free expression in newspapers such as the Manchester Guardian. However, despite the possibility of transportation, or even the death penalty for treason, movements such as the Chartists began to make their demands known. The character of socialism was transformed in the late 19th Century by the gradual extension of the Franchise and the legalization of the unions. The revolutionary potential for socialism was quelled and replaced by a belief in gradualism through parliamentary means. Reforms initiated in the latter part of the 19th Century in Britain had the aim of integrating the industrial working class. It became increasingly difficult for working class movements to maintain revolutionary as opposed to evolutionary principles in regards to the achievement of their aims. The 1917 Bolshevik revolution entrenched the split between evolutionary and revolutionary socialism. Revolutionary socialists believe that there can be no accommodation whatsoever with capitalism is socialism is to take root. Socialists, democratic socialists or social democrats believe that socialism can only be advanced through democratic and constitutional/legal/parliamentary means. Socialism in Africa, Asia and Latin America has taken the form of Nationalistic socialism, parly as a legacy of the anti-colonial struggled witnessed in these parts of the world. Class exploitation and oppression was viewed through the prism of colonial exploitation and oppression. This created a strain of nationalism combined with socialism which is better examined in Nationalism on paper 5. Bolshevism initially triumphed in the post war era firstly in Eastern Europe, and China and then later in Cuba, Laos, Vietnam, North Korea and Cambodia. It was intermittently successful in Latin America and Africa but was vigorously resisted in US foreign policy objectives, framed to prevent the spread of communism, and famously expressed in the Truman Doctrine and in NSC – 168. In the late twentieth century socialism has suffered a near cataclysmic series of reverses. In its bolshevist variant the collapse of Eastern Europe and dissolution of the USSR, its revolutionary form suffered a most decisive reverse. In China experimentation with market economics is gradually necessitating political realignment and in Western Europe, most specifically in the UK, socialist parties have abandoned large parts of the ideological heritage, embracing neo-liberal and conservative ideas. This inevitably has cast doubt on the future of socialism as a creed. Socialism emphasises the primacy of the community rather than the individual. At its heart is the belief that human beings have the capacity for collective rather than individual action and that collective action has naturally more harmonious results than selfish individualism. Socialists have a resolute belief in the malleability of human nature. Human nature is generally positive and ill will or anti-social behaviour is the product of social and economic circumstance. Indeed Robert Owen wrote of the absurdity or attributing praise or blame to individuals since everyone was a product of the circumstances they find themselves in.Thus greed and self interest are not natural at all they are engendered by a system that necessitates greed and self interest. Further socialism jettisons the argument that there is any such entity as an atomised individual. Individuals are social beings and social actors. The community bears upon them and they bear back upon the community. Selfish, acquisitive, materialistic or instrumental aggression are socially conditioned rather than natural. They emanate from a system organised both economically and socially to produce such behaviours. Humans are encouraged to act in ways alien to their nature, but perhaps logical within the constraints of current economic, political and social forms of organisation. An even more radical claim of socialism lies in what it believes to be the waste of human potential that arises from conflict instead of cooperation and egoism instead of altruism. Humans are best able to fulfil their potential where cooperation, selflessness and altruism reign over greed and individualism. There have been numerous attempts to place this philosophy at the heart of communal living experiments. Utopian communities such as those pioneered by Robert Owen had limited success, communes less so. However Kibbutzim in Israel have been particularly successful forms of experiment in communal living. If human beings are social animals then the most natural form of relationship between humans is one of cooperation. Competition denies and runs in the face of true human nature promoting aggression and selfishness. Motivation need not only come in the form of material incentives. Individuals can be motivated by social reward, reciprocation and moral incentives too. Capitalism has many contradictions. Hard work is no guarantee of material reward. Material riches are no guarantor of contentment or of happiness. However a contribution to the common good is both a rational and moral choice which increases the wealth of human happiness. Material incentives encourage wealth acqusition and gross disparities between people. Material wealth also encourages the exploitation and appropriation of resources. It may also involve the exploitation of human resources and may lead to conflict and war. A differential allocation of resources and rewards is not disputed by most socialists. Equality of outcome is very difficult, if not impossible, to achieve. However differentials should not be extreme and the allocation of resources and wealth such be perceived as just. Such a distribution is more likely in systems based on cooperation rather than competition. As a result socialists have experimented with forms of economic activity based on cooperation and shared ownership rather than on competition and private ownership. All employees of the John Lewis partnership are also share owners in the enterprise. The cooperative societies of the 19th Century were set up and run along principles of shared ownership. Credit unions offer banking facilities on a not for profit basis to poor sections of the community unable to obtain high street banking facilities. Any profits made are redistributed to the shareholders (i.e the customers in the form of interest on their accounts or in the form of reduced interest repayments). In the 1970s experiments were taken by central government in the creation of industrial cooperatives such as for example the Meridian Project. Far from being a failed historical relic there are many worker self management enterprises flourishing today, most notably in Latin America. Some of these attempts at cooperation based enterprise have been more successful than others. The commitment to quality is at the heart of socialism, yet there are many different forms of equality and many practical constraints on both achieving and maintaining equality. Socialists with liberals a commitment to social and political equality. Liberals see equality in these spheres as a necessary precondition of equality of opportunity. However this is where socialism and liberalism depart. Socialists also believe in economic equality. Liberalism views any attempt at economic equality as an unnecessary and perhaps even dangerous interference in individual liberty. Liberals believe that economic differentials can be explained largely in terms of the uneven distribution of talents and efforts. Some individuals have more ability than others and some work harder than others. They do so because they are incentivised to do so mainly through the acquisition of material rewards. Socialists however believe that economic differentials are fundamentally unjust. They do not reflect the distribution of talents and efforts – but rather inequitable social and economic arrangements which foster poverty existing side by side with great wealth. Such arrangements promote an unfair and unjust distribution of wealth and material resources. One of the primary reasons for the perpetuation of economic inequality is the absence of real social and political equality. Whilst liberals essentially see the social and political spheres as centres of equality of opportunity socialists most definitely do not. Because of social inequalities individuals are unable to realise their true potential. The birthright of some maximises and exaggerates their abilities and efforts whilst for others it acts to hamper the expression of abilities and efforts. Marxists see inequality in what they believe to be purely objective class terms. One’s social class is determined objectively by one’s relations to the means of production. Ownership of private property and the means of production denotes membership of the bourgeosie. The proletariat have no property and must therefore sell their labour to survive. In order to achieve social equality and the equal distribution of the ‘fruits of industry’ it was therefore necessary to abolish private property. Non revolutionary socialists such as those committed to the achievement of socialism through democracy and parliamentary means however take the view that greater redistribution of wealth is the key to a more equitable and socialist society. The welfare state is an example of this creed in action as are higher taxes for the better off. ‘…from each according to his ability, to each according to his needs…’ Marx. The egalitarianism at the heart of socialism is strongly informed by theories of the just distribution of resources and material rewards. They are neither frivolous nor transitional. They are basic and fundamental to human existence. There is a moral imperative towards the satisfaction of human needs. A need is a necessity. It demands satisfaction. Wants are a matter of personal judgment in a particular social and cultural context. In a materialistic culture wants become more extravagant. Needs based theories of social justice cut to the very centre of the human condition. Rather than see re-distribution as a threat to freedom, socialists see it as a prerequisite to freedom. Without the satisfaction of basic needs and even of those higher needs of love, affection and stimulation humans are incapable of achieving their potential. Their freedom is negated. Through addressing needs as the fundamental basis of human rights, need satisfaction actually enlarges freedom – it unleashes potential. For socialists then vast wealth accumulation is obscene when basic needs such as health and hunger are not met for some others. Further it is immoral when sufficient resources exist but their allocation is grossly distorted. There is a philosophical and moral presumption that is not shared by liberals or by conservatives. This is the presumption that the needs of one person constitute a moral imperative or obligation on another person to act, or at least to give consent to the appropriation of some of his property in order to satisfy the needs of others. o The right to property should therefore be balanced against the rights of the community. o Marx envisaged the ultimate abolition of private property, but did not set out how this could be achieved in practice. In the Soviet Union a process of collectivisation took place placing industries under state control and management. o It was believed that such an economy would benefit from rational planning of output, targets and prices based on need not the ‘irrational’ pursuit of profit. o The fruits of the planned economy would then benefit everyone. o However, in the context of the Soviet Union forced collectivisation was resisted resulting in the Stalinist purges of the 1930s. State control began to be equated with political repression. o Although many in the west began to see some form of socialism as inevitable or even desirable, post war moves towards nationalisation were much more selective. o The post war settlement in the UK focused on nationalising the so called ‘commanding heights’ of the economy. o The Creation of the NHS in 1948 – free health care at the point of delivery. o These reforms laid the planks of the post war consensus, observed by both Conservative and Labour Governments until the mid 1970s when the post war consensus collapsed and both parties moved away from the centre. o The perceived failure of nationalisation, which had critics from both the left and the right, has meant that those committed to socialism have had to search for alternatives to state ownership or abandon opposition to private ownership. o Some socialists advocate small self managing communities based on a model of shared ownership. This however seems idealistic in a dynamic, large scale, globalised economy. Socialism is a very diverse political creed encompassing many contradictory strands. Partly this has evolved out of competing definitions of socialism, for example concerning whether socialism is compatible with capitalism. Thus socialists differ about ends. Socialists also differ about means – how should these ends be achieved? Two major strands, the revolutionary and the evolutionary can be identified. There was a widespread view that capitalism was a system of naked exploitation and oppression. The pressure for reform and the oppressive response by the authorities to such pressures, meant that the industrial working class had little room for legitimate political participation or influence. This further increased the logic of revolution as the only solution to the problems of the working class. There are also theoretical underpinnings for revolution as the only true path to socialism. In other words the state is not a necessary evil or a nightwatchman, a neutral arbiter ensuring fair play. It is active in supporting the interests of capital. Thus, the bourgeois state must be overthrown. The personnel of the polity are drawn from a relatively privileged segment of society (Miliband)and the state has at its disposal both ideological and repressive means of control (Althusser). Governments in democracies, even nominally ‘socialist’ ones have to pay heed to the interests of finance, business and industry. Revolution, in response to colonialism, has been the norm in the developing world. The appetite for popular revolt and revolution waned as the 19th Century progressed. This was in part due to political compromises adopted by the state in response to the revolutionary fervour that dominated the early part of the century. Wages and living standards began to rise, partly as a result of colonial expansion, and working class interests were represented in a variety of ways through trade unions and political parties. Universal male suffrage and later female suffrage shifted socialists attention away from revolution towards evolutionary, democratic or parliamentary paths to socialism, something even Marx considered at least possible. The Fabian movement believed in patient opposition to capitalism in order to bring about its slow demise. Liberal capitalism, with its reforms, would gradually evolve into a socialist order. The elites could be converted to the logic of socialism, its moral superiority and its rational efficiency. A socialist economy seemed more logical given the way in which wartime planning and controls had successfully contributed to the war effort. Socialism was thus seen as inevitable. Lassalle (1825-1864) had argued that the extension of political democracy would enable the state to respond to working class interests whilst Bernstein, Evolutionary Socialism, (1898) argued that the extension of democracy had made the necessity of revolution redundant. In some European states in the 1960s and 1970s the divisions between parliamentary and revolutionary parties became increasingly blurred with communists parties increasingly seeking parliamentary representation,. Giving rise to a particular strand of socialism known as Eurocommunism. Revolution as a political tactic or strategy was abandoned, in favour of a democratic path to socialism. The collapse of single party rule in the communist countries of Eastern Europe in the ‘velvet revolutions’ of 1989 seemed to confirm the necessity of adopting such a tactic. Optimism in gradualism was founded on a number of assumptions. Universal suffrage had led to political equality which in turn would lead to a system that favioured the interests of the majority. Socialism was the natural ‘home’ of the working class, best reflecting their interests and aspirations. The electoral success of socialist parties was inevitable. Socialism offered social justice through redistribution and social reform. Political democracy and equality would be the necessary and sufficient precondition of social equality. Such assumptions have not always been borne out by reality. Often socialist parties have had to water down their ideological beliefs in order to achieve power. New Labour’s realignment is a classic case in point. Further socialist parties of themselves do not according to Kautsky rule freely. The desertion of large segments of skilled working class voters towards conservative parties has meant that socialist parties have had to forge new alliances with constituencies of middle class voters sympathetic to the progressive aims of socialist parties. Socialist parties have been forced into an accommodation with capitalism. Statism is no longer seen to work. Socialism has become equated with an attempt to make capitalism and markets work and less concerned with social engineering. This shift in the working class’s priorities is not however a consciously freely arrived at choice. Marxists contend that rather the working class have been subject to a process of ideological manipulation. The mass media are instrumental in purveying views consistent with capitalism rather than socialism as they themselves are part of capitalist conglomerates. It seems in conclusion that there are many barriers to gradualism in regards to achieving a recognisably socialist society. Even if it is accepted that there is political and social equality (and this is highly contentious) the gap between richest and poorest has never been wider and the prospects of a social system based on fraternity and cooperation, along with the abolition of private property seems as far fetched as ever. Communism is an ideology that promotes establishment of a classless, statelesssocial organization based on common ownership of the means of production. It is usually considered a branch of the broader socialist movement that draws on the various political and intellectual movements that trace their origins back to the work of Karl Marx. Communism as a political goal is a form of future social organization, although Marxists have described early forms of human social organization as “primitive communism“. Self-identified communists hold a variety of views, including Marxism Leninism, Trotskyism, council communism, Luxemburgism, anarchist communism, Christian communism, and various currents of left communism. However, the offshoots of the Marxist-Leninist interpretations of Marxism are the most well-known of these and have been a driving force in international relations during most of the 20th century. Karl Marx held that society could not be transformed from the capitalistmode of production to the advanced communist mode of production all at once, but required a transitional period which Marx described as the revolutionarydictatorship of the proletariat, the first stage of communism. The communist society Marx envisioned emerging from capitalism has never been implemented, and it remains theoretical; Marx, in fact, commented very little on what communist society would actually look like. However, the term “Communism”, especially when it is capitalized, is often used to refer to the political and economic regimes under Communist parties that claimed to embody the dictatorship of the proletariat. In the late 19th century, Marxist theories motivated socialist parties across Europe, although their policies later developed along the lines of “reforming” capitalism, rather than overthrowing it. One exception was the Bolshevik faction of the Russian Social Democratic Labour Party headed by Vladimir Lenin, succeeded in taking control of the country after the toppling of the Provisional Government in the Russian Revolution of 1917. In 1918, this party changed its name to the Communist Party, thus establishing the contemporary distinction between Communism and other trends of socialism. After the success of the October Revolution in Russia, many socialist parties in other countries became Communist parties, signaling varying degrees of allegiance to the new Communist Party of the Soviet Union. After World War II, Communists consolidated power in Eastern Europe, and in 1949, the Communist Party of China (CPC) led by Mao Zedong established the People’s Republic of China, which would later follow its own ideological path of Communist development. Among the other countries in the Third World that adopted a pro-Communist government at some point were Cuba, North Korea, North Vietnam, Laos, Angola, and Mozambique. By the early 1980s almost one-third of the world’s population lived in Communist states. Communist themselves repudiate the usage of the term “communist state”, as a communist society by their definition is a state-less society. The terms used by the communist movement to describe these states are either socialist states or ‘people’s democracies’. Since the early 1970s, the term Eurocommunism was used to refer to the policies of reformist Communist parties in western Europe, break with the tradition of uncritical and unconditional support of the Soviet Union. Such parties were politically active and electorally significant in Italy (PCI), France (PCF), and Spain (PCE). With the decline of the Communist governments in Eastern Europe from the late 1980s and the breakup of the Soviet Union in December 1991, Communism’s influence has decreased dramatically in Europe. However, around a quarter of the world’s population still lives in Communist states, mostly in the People’s Republic of China. There are also communist movements in Latin America and South Asia that have significant popular support. However, even single-party Communist states like China and Vietnam have adopted capitalist economic mechanisms in certain limited ways, which some observers say is at odds with the original socialist ideals of communism. In the history of Western thought, certain elements of the idea of a society based on common ownership of property can be traced back to ancient times. In the 17th century, communist thought arguably surfaced again in England. In 17th century England, a Puritan religious group known as the Diggers advocated the abolition of private ownership of land. Eduard Bernstein, in his 1895 Cromwell and Communism argued that several groupings in the English Civil War, especially the Diggers espoused clear communistic, agrarian ideals, and that Oliver Cromwell‘s attitude to these groups was at best ambivalent and often hostile. Criticism of the idea of private property continued into the Age of Enlightenment of the 18th century, through such thinkers as Jean Jacques Rousseau in France. Later, following the upheaval of the French Revolution, communism emerged as a political doctrine. François Noël Babeuf, in particular, espoused the goals of common ownership of land and total economic and political equality among citizens. Various social reformers in the early 19th century founded communities based on common ownership. But unlike many previous communist communities, they replaced the religious emphasis with a rational and philanthropic basis. Notable among them were Robert Owen, who founded New Harmony in Indiana (1825), and Charles Fourier, whose followers organized other settlements in the United States such as Brook Farm (1841–47). Later in the 19th century, Karl Marx described these social reformers as “utopian socialists” to contrast them with his program of “scientific socialism” (a term coined by Friedrich Engels). Other writers described by Marx as “utopian socialists” included Charles Fourier and Saint-Simon. In its modern form, communism grew out of the socialist movement of 19th century Europe. As the Industrial Revolution advanced, socialist critics blamed capitalism for the misery of the proletariat — a new class of urban factory workers who labored under often-hazardous conditions. Foremost among these critics were the German philosopher Karl Marx and his associate Friedrich Engels. In 1848 Marx and Engels offered a new definition of communism and popularized the term in their famous pamphlet The Communist Manifesto. Like other socialists, Marx and Engels sought an end to capitalism and the systems which they perceived to be responsible for the exploitation of workers. But whereas earlier socialists often favored longer-term social reform, Marx and Engels believed that popular revolution was all but inevitable, and the only path to socialism. They believed that communism allowed people to do what they want, but also put humans in such conditions and such relations with one another that they would not wish to exploit, or have any need to. Marxism holds that a process of class conflict and revolutionary struggle will result in victory for the proletariat and the establishment of a communist society in which private ownership is abolished over time and the means of production and subsistence belong to the community. Marx himself wrote little about life under communism, giving only the most general indication as to what constituted a communist society. It is clear that it entails abundance in which there is little limit to the projects that humans may undertake. In the late 19th century the terms “socialism” and “communism” were often used interchangeably. However, Marx and Engels argued that communism would not emerge from capitalism in a fully developed state, but would pass through a “first phase” in which most productive property was owned in common, but with some class differences remaining. The “first phase” would eventually give way to a “higher phase” in which class differences were eliminated, and a state was no longer needed. Lenin frequently used the term “socialism” to refer to Marx and Engels’ supposed “first phase” of communism and used the term “communism” interchangeably with Marx and Engels’ “higher phase” of communism. These later aspects, particularly as developed by Lenin, provided the underpinning for the mobilizing features of 20th century Communist parties. Later writers such as Louis Althusser and Nicos Poulantzas modified Marx’s vision by allotting a central place to the state in the development of such societies, by arguing for a prolonged transition period of socialism prior to the attainment of full communism. In the late 19th century Russian Marxism developed a distinct character. The first major figure of Russian Marxism was Georgi Plekhanov. Underlying the work of Plekhanov was the assumption that Russia, less urbanized and industrialized than Western Europe, had many years to go before society would be ready for proletarian revolution could occur, and a transitional period of a bourgeois democratic regime would be required to replace Tsarism with a socialist and later communist society. In Russia, the 1917 October Revolution was the first time any party with an avowedly Marxist orientation, in this case the Bolshevik Party, seized state power. The assumption of state power by the Bolsheviks generated a great deal of practical and theoretical debate within the Marxist movement. Marx predicted that socialism and communism would be built upon foundations laid by the most advanced capitalist development. Russia, however, was one of the poorest countries in Europe with an enormous, largely illiterate peasantry and a minority of industrial workers. It should be noted, however, that Marx had explicitly stated that Russia might be able to skip the stage of bourgeois capitalism. Other socialists also believed that a Russian revolution could be the precursor of workers’ revolutions in the West. The moderate Mensheviks opposed Lenin’s Bolshevik plan for socialist revolution before capitalism was more fully developed. The Bolsheviks’ successful rise to power was based upon the slogans “peace, bread, and land” and “All power to the Soviets”, slogans which tapped the massive public desire for an end to Russian involvement in the First World War, the peasants’ demand for land reform, and popular support for the Soviets. The usage of the terms “communism” and “socialism” shifted after 1917, when the Bolsheviks changed their name to the Communist Party and installed a single party regime devoted to the implementation of socialist policies under Leninism. enin thus created the Third International (Comintern) in 1919 and sent the Twenty-one Conditions, which included democratic centralism, to all European socialist parties willing to adhere. In France, for example, the majority of the SFIO socialist party split in 1921 to form the SFIC (French Section of the Communist International). Henceforth, the term “Communism” was applied to the objective of the parties founded under the umbrella of the Comintern. Their program called for the uniting of workers of the world for revolution, which would be followed by the establishment of a dictatorship of the proletariat as well as the development of a socialist economy. Ultimately, if their program held, there would develop a harmonious classless society, with the withering away of the state. During the Russian Civil War (1918-1922), the Bolsheviks nationalized all productive property and imposed a policy of war communism, which put factories and railroads under strict government control, collected and rationed food, and introduced some bourgeois management of industry. The NEP lasted until 1928, when Joseph Stalin achieved party leadership, and the introduction of the first Five Year Plan spelled the end of it. Following the Russian Civil War, the Bolsheviks formed in 1922 the Union of Soviet Socialist Republics (USSR), or Soviet Union, from the former Russian Empire. Following Lenin’s democratic centralism, the Communist parties were organized on a hierarchical basis, with active cells of members as the broad base; they were made up only of elite cadres approved by higher members of the party as being reliable and completely subject to party discipline. Marxist-Leninism is a version of socialism, with some important modifications, adopted by the Soviet Union under Stalin. It shaped the Soviet Union and influenced Communist Parties worldwide. It was heralded as a possibility of building communism via a massive program of industrialization and collectivization. The rapid development of industry, and above all the victory of the Soviet Union in the Second World War, maintained that vision throughout the world, even around a decade following Stalin’s death, when the party adopted a program in which it promised the establishment of communism within thirty years. Under Stalin, the Communist Party of the Soviet Union adopted the theory of “socialism in one country” and claimed that, due to the “aggravation of class struggle under socialism“, it was possible, even necessary, to build socialism alone in one country, the USSR. This line was challenged by Leon Trotsky, whose theory of “permanent revolution” stressed the necessity of world revolution. Maoism is the Marxist Leninist trend associated with Mao Zedong. After the death of Stalin in 1953, the Soviet Union’s new leader, Nikita Khrushchev, denounced Stalin’s crimes and his cult of personality. He called for a return to the principles of Lenin, thus presaging some change in Communist methods. However, Khrushchev’s reforms heightened ideological differences between the People’s Republic of China and the Soviet Union, which became increasingly apparent in the 1960s. As the Sino-Soviet Split in the international Communist movement turned toward open hostility, China portrayed itself as a leader of the underdeveloped world against the two superpowers, the United States and the Soviet Union. The Sino-Soviet Split resulted in divisions amongst communist parties around the world. Notably, the Party of Labour of Albania sided with the People’s Republic of China. Effectively, the CPC under Mao’s leadership became the rallying forces of a parallel international Communist tendency. The ideology of CPC, Marxism-Leninism-Mao Zedong Thought (generally referred to as ‘Maoism’), was adopted by many of these groups. Trotsky and his supporters organized into the Left Opposition, and their platform became known as Trotskyism. Stalin eventually succeeded in gaining control of the Soviet regime, and their attempts to remove Stalin from power resulted in Trotsky’s exile from the Soviet Union in 1929. During Trotsky’s exile, world communism fractured into two distinct branches: Marxism-Leninism and Trotskyism. Trotsky later founded the Fourth International, a Trotskyist rival to the Comintern, in 1938. Trotskyist ideas have continually found a modest echo among political movements in some countries in Latin America and Asia, especially in Argentina, Brazil, Bolivia and Sri Lanka. Many Trotskyist organizations are also active in more stable, developed countries in North America and Western Europe. Today, Trotskyists are organized in various international organizations and tendencies. Today there are areas of the world where Trotskyist movements are rather large. However, Trotskyist movements have never coalesced in a mass movement that has seized state power. By virtue of the Soviet Union’s victory in the Second World War in 1945, the Soviet Army had occupied nations in both Eastern Europe and East Asia; as a result, communism as a movement spread to many new countries. This expansion of communism both in Europe and Asia gave rise to a few different branches of its own, such as Maoism. Communism had been vastly strengthened by the winning of many new nations into the sphere of Soviet influence and strength in Eastern Europe. Governments modeled on Soviet Communism took power with Soviet assistance in Bulgaria, Czechoslovakia, East Germany, Poland, Hungary and Romania. A Communist government was also created under Marshal Tito in Yugoslavia, but Tito’s independent policies led to the expulsion of Yugoslavia from the Cominform, which had replaced the Comintern. Other areas where rising Communist strength provoked dissension and in some cases led to actual fighting include the Korean Peninsula, Laos, many nations of the Middle East and Africa, and, especially, Vietnam. With varying degrees of success, Communists attempted to unite with nationalist and socialist forces against what they saw as Westernimperialism in these poor countries. In 1985, Mikhail Gorbachev became leader of the Soviet Union and relaxed central control, in accordance with reform policies of glasnost (openness) and perestroika (restructuring). The Soviet Union did not intervene as Poland, East Germany, Czechoslovakia, Bulgaria, Romania, and Hungary all abandoned Communist rule by 1990. In 1991, the Soviet Union itself dissolved. By the beginning of the 21st century, states controlled by Communist parties under a single-party system include the People’s Republic of China, Cuba, Laos, North Korea, and Vietnam. Communist parties, or their descendant parties, remain politically important in many countries. In South Africa, the Communist Party is a partner in the ANC-led government. In India, as of 2007, the national government relies on outside support from the communist parties and communists lead the governments of three states, with a combined population of more than 115 million. In Nepal, communists hold a majority in the interim parliament. The People’s Republic of China has reassessed many aspects of the Maoist legacy; and the People’s Republic of China, Laos, Vietnam, and, to a far lesser degree, Cuba have reduced state control of the economy in order to stimulate growth. The People’s Republic of China runs Special Economic Zones dedicated to market-oriented enterprise, free from central government control. Marxist critics of the Soviet Union, most notably Trotsky, referred to the Soviet system, along with other Communist states, as “degenerated” or “deformed workers’ states,” arguing that the Soviet system fell far short of Marx’s communist ideal and he claimed working class was politically dispossessed. The ruling stratum of the Soviet Union was held to be a bureaucratic caste, but not a new ruling class, despite their political control. They called for a political revolution in the USSR and defended the country against capitalist restoration. Others, like Tony Cliff, advocated the theory of state capitalism, which asserts that the bureaucratic elite acted as a surrogate capitalist class in the heavily centralized and repressive political apparatus. 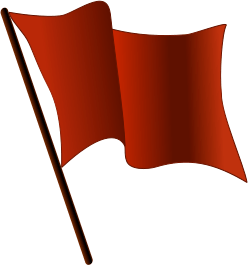 Non-Marxists, in contrast, have often applied the term to any society ruled by a Communist Party and to any party aspiring to create a society similar to such existing nation-states. In the social sciences, societies ruled by Communist Parties are distinct for their single party control and their socialist economic bases. While anticommunists applied the concept of “totalitarianism” to these societies, many social scientists identified possibilities for independent political activity within them, and stressed their continued evolution up to the point of the dissolution of the Soviet Union and its allies in Eastern Europe during the late 1980s and early 1990s. Today, Marxist revolutionaries are conducting armed insurgencies in India, Philippines, Iran, Turkey, and Colombia. Why have democratic socialists believed in the ‘inevitability of gradualism’? The idea of the ‘inevitability of gradualism’ was advocated by Fabian socialists in the UK, but its broad principles were accepted by Eduard Bernstein and other early democratic socialists who supported the ‘parliamentary’ road to socialism. Gradualism is the belief that progress is brought about by gradual, piecemeal improvements, rather than dramatic upheavals. It implies that change occurs through a legal and peaceful process of reform. The idea that gradualism is inevitable was based on a series of assumptions, widely held by early democratic socialists. First, the progressive extension of the franchise would eventually lead to the establishment of universal adult suffrage, and therefore of political equality. Second, political equality worked in the interests of the working class, easily the most numerous class in any industrial society. Third, as socialism is the natural ‘home’ of the working class, working class voters will support socialist parties, bringing them to power. Fourth, once in power, socialist parties would be able to carry out a fundamental transformation of society through a process of social reform. The working class could thus use the ballot box to introduce socialism, allowing socialism to become an evolutionary outgrowth of capitalism. ‘Socialism is defined by its opposition to capitalism.’ Discuss. The relationship between socialism and capitalism is one that has opened up divisions within socialism itself. While fundamentalist forms of socialism can be said to be defined by their opposition to capitalism, revisionist socialism has sought instead to reconcile socialism with capitalism. Fundamentalist socialists, as Marxists or communists, have viewed capitalism as fundamentally flawed and irredeemable. Socialism is therefore defined by the attempts to overthrow capitalism and replace it by a qualitatively different social system. In this view, capitalism is associated with class oppression on systematic economic exploitation. For Marxists, this is reflected in irreconcilable class conflict between the bourgeoisie, as the owners of private property, and the proletariat, who subsist only through the sale of their labour power. Exploitation is explained in terms of surplus value and the fact that profit is only made through the expropriation of labour power. Capitalism cannot therefore be reformed improved; it must be completely removed and replaced by a system founded on common ownership. Marxists, indeed, believed that this process was inevitable, as it stems from the inherent contradictions of capitalist society. However, revisionist socialists or social democrats have revised their analysis of capitalism. Instead of viewing it as inherently flawed, they accept the market as the only reliable mechanism for generating wealthy. In this view, the problem with capitalism is its tendency to distribute wealth unjustly and unequally, a tendency that can be contained by economic and social reform. Social democrats therefore believe in reformed capitalism or ‘humanised’ capitalism. This form of socialism is not defined by its opposition to capitalism, but by its quest for social justice and distributive equality within a capitalist system. Why has socialism been viewed as a form of class politics? Socialists have traditionally viewed social class as the deepest and most politically significant of social divisions. A social class is a group of people who share a similar socio- economic position. In the Marxist tradition, class is linked to economic power, as defined by the individual’s relationship to the means of production. Social democrats, on the other hand, define social class in terms of income and status differences between non- manual workers (middle class) and manual workers (the working class). Socialists use social class as an analytical tool, viewing classes as the principal actors in history and the main source of economic and social change. This is most evident in the Marxist belief that class conflict is the motor of history, capitalist society being doomed because the propertyless proletariat are destined to rise up and overthrow the ‘ruling class’, the property-owning bourgeoisie. All forms of socialism are characterised by the desire to reduce or overthrow class divisions. In the Marxist view, the overthrow of capitalism through a proletarian revolution will lead to the creation of a classless communist society. From a social democratic perspective, socialism is associated with narrowing of divisions between the middle class and the working class brought about through economic and social intervention. This leads to social amelioration and class harmony. Why did Marx believe that capitalism was doomed to collapse? Marx explained the inevitability of capitalism’s collapse in terms of his philosophy of history. For Marx, the driving force of historical change was the dialectic, a process of interaction between two opposing forces leading to a further or higher historical stage. Whereas Hegel explained dialectical change in terms of ideas or the ‘world spirit’, Marx gave dialectic a materialist interpretation. Capitalism is doomed to collapse because of its own internal contradictions. In particular, capitalism embodies its own antithesis, the proletariat, seen by Marx as the ‘gravedigger’ of capitalism. Conflict between capitalism and the proletariat will therefore lead to a higher stage of development in the establishment of a socialist, and eventually a communist, society. Marx believed that the contradictions of capitalism would come to the surface as the proletariat achieved revolutionary class consciousness, an awareness of the fact of its own exploitation. This would occur as capitalism went through a series of deepening crises, leading to the immiseration of the proletariat. This would result in a proletarian revolution which was destined to overthrow capitalism. ‘Anarchism is closer to liberalism than it is to socialism.’ Discuss. Anarchism can be viewed as a point of overlap between liberalism and socialism, the point at which both ideologies reach anti-statist conclusions. Anarchism therefore has a dual character: it can be interpreted as either a form of ‘ultra-liberalism’ or as a form of ‘ultra- socialism’. However, there is disagreement within anarchism about the relative importance of liberalism and socialism, depending on whether the anarchism in question is based on an extreme form of liberal individualism or an extreme form of socialist collectivism. Individualist anarchists reach their conclusions by pushing liberal individualism to its logical extreme. This implies individual sovereignty, the idea that absolute and unlimited authority resides in each human being. From this perspective, any constraint on the individual is evil, especially when it is imposed by a sovereign, compulsory and coercive state. Individualist anarchists also draw on economic liberalism in endorsing market economics as a way of bringing about equilibrium within a stateless society. However, significant differences exist between liberalism and individualist anarchism. First, even classical liberals argue that a minimal state is necessary to prevent self-seeking individuals from abusing one another. Law therefore exists to protect freedom, rather than constrain. Modern liberals take this argument further and defend state intervention on the grounds that it enlarges positive freedom. Second, liberals believe that government power can be ‘tamed’ or controlled by the development of constitutional representative institutions. Liberal-democratic states are therefore not viewed as an offence against the individual. Anarchist conclusions can also be reached by pushing socialist collectivism to its limits. In that sense, anarchism shares with socialism a view of human beings as essentially social creatures, emphasizing the importance of sympathy, affection and co-operation. This is reflected in parallels between collectivist anarchism and Marxism, which both look to the construction of a stateless society, albeit achieved through different means. Nevertheless, anarchism and socialism diverge at a number of points, for example, Marxists have called for a revolutionary ‘dictatorship of the proletariat’, in effect, a temporary proletarian state that will protect the gains of the revolution. This clashes with the anarchist belief that all states are evil and oppressive. Similarly, anarchism differs from democratic socialism, in that the latter uses the state to reform or ‘humanise’ the capitalist system and to bring about greater equality and social justice. Distinguish between fundamentalist socialism and revisionist socialism. Fundamentalist socialism is a form of socialism that seeks to abolish capitalism and replace it with a qualitatively different kind of society. In this view, capitalism is seen to be fundamentally corrupt or fatally flawed, stemming from the fact that it is a system of class exploitation. Socialism, in this view, is defined by the desire to abolish private property. Revisionist socialism, on the other hand, is a form of socialism that has revised its critique of capitalism and seeks to reconcile greater social justice with surviving capitalist forms. In this view, the goal of socialism is to reform or ‘humanise’ capitalism usually through an extension of economic and social intervention. Revisionist socialism practises the politics of social justice rather than the politics of ownership. Major divisions have long existed within socialism over the means through which it can, and should, be achieved. In simple terms, this relates to rival revolutionary and reformist ‘roads to socialism’. Before political democracy had arrived, revolution was the only practicable way of bringing about political change. Because it was believed that the state responds only to the interests of the economically dominant class, a peaceful and constitutional transition to socialism through reform is impossible. Revolution allowed all vestiges of the capitalist system, and its supporters, to be removed. The arrival of political democracy led to the certain victory of social democracy, because the working class constituted the majority in society. The working class would vote for socialist parties because socialism is in their interests. Once elected, socialist parties would bring about a gradual, peaceful and perhaps inevitable transition from capitalism to socialism.. However, socialist disagreements about the means of achieving socialism have largely been abandoned. Revolution has had declining significance within socialism since the late nineteenth century, particularly in more developed capitalist societies. After 1945, the revolutionary road was widely considered to be unviable, which led Marxist parties towards Eurocommunism. The collapse of communism in the revolutions of 1989-91 effectively led to the demise of revolutionary communism, meaning that socialists have largely ceased to disagree about the issue of means. The advent of anti-capitalist activism has nevertheless sometimes been seen to indicate revived interest in radical or even revolutionary political strategies. Support for state intervention and particularly welfare provision designed to assist the weak and the vulnerable. Socialists have endorsed collectivism because of their vision of human beings as social creatures, capable of overcoming social and economic problems by drawing on the power of the community rather than simply individual effort. Human beings are therefore ‘comrades’, ‘brothers’ or ‘sisters’, tied to one another by the bonds of common humanity. This is expressed in the principle of fraternity, the bonds of comradeship between and amongst human beings. It upholds justice or fairness, as inequality usually reflects social injustices rather than individual inadequacies. It fosters community and cooperation. It helps to ensure that humans are fulfilled and satisfied creatures, as their basic needs are properly satisfied. Fundamentalist socialism has endorsed absolute social equality, in the form of the common ownership of productive wealth or communism. This implies a radical emphasis on moral incentives rather than economic incentives. However, some may argue that fundamentalist socialism is defined more by the desire to collectivise wealth (the politics of ownership) than by a commitment to greater equality (the politics of social justice. Absolute social equality has been abandoned in favour of relative social equality and the need to maintain economic incentives. Social equality has significantly been replaced by the idea of equality of opportunity, emphasising a ‘level playing field’ rather than more equal social outcomes. This trend has been taken furthest by neo-revisionists or supporters of ‘new’ social democracy who have been willing to tolerate significant levels of social inequality and have advanced alternative ideas such as asset-based egalitarianism. In what sense do socialists have a positive view of human nature? Because they believe that human nature is ‘plastic’, moulded by the experiences and circumstances of social life, they believe that human beings have a high capacity for personal and social development, allowing, at times, to advance utopian views. Socialists believe that human beings are social animals, suggesting that the potential for cooperative, sociable and gregarious behaviour lies at the core of their nature. This suggests that social relationships tend to be characterised by harmony, mutual respect and peaceful interaction, in line with the principal of collectivism. Drawing inspiration from Enlightenment rationalism, socialists also believe that human beings are reason-guided creatures, capable, apart from anything else, of reshaping their lives and their society for the better. The liberal view of equality emphasises foundational equality (that people are ‘born’ equal), implying support for both formal equality and equality of opportunity. Socialists criticise the liberal view of equality both on the grounds that it tends to conceal inequalities of the capitalist system and typically serves to justify social inequality. Formal equality, for instance, may treat individuals alike in terms of their rights and entitlements, but takes no account of their often very different economic and social circumstances. The doctrine of equality of opportunity both serves to promote rivalry and competition amongst individuals and is often used to imply that unequal outcomes are justifiable because they reflect unequal personal merit (ability and willingness to work). Essay Questions –No Essay Set. Revolution refers to a fundamental and irreversible change, typically brought about through the exercise of force. Reform, on the other hand, refers to gradual, piecemeal improvements, brought about peacefully through the existing constitutional structure. Socialists have advocated revolution rather than reform for a number of reasons, including the following. Before the advent of political democracy, the working masses did not have the opportunity to advance socialism through reformist and constitutional measures, leaving revolution as the only means of achieving socialism. Revolution has the advantage that it promises a root-and-branch transformation of capitalism, and therefore has sometimes (but not always) been attractive to fundamentalist socialists, such as Marxists. For many revolutionary socialists, reformism is impossible because it suggests that socialism can be brought about through a legal and political structure that is fundamentally biased in favour of capitalism and therefore against socialism. Marxists explain this in terms of base/superstructure analysis. How and why has anarchism been associated with collectivism? Collectivism is, broadly, the belief that collective human action is morally and economically superior to individual self-striving. Anarchism has been associated with collectivism through the collectivist anarchist tradition, sometimes called social anarchism. This ‘classical’ anarchist tradition has philosophical and ideological overlaps with socialism, and is expressed, variously, in the ideas of mutualism, anarcho-syndicalism and anarcho- communism. Anarchism has been associated with collectivism because anarchist conclusions can be reached by pushing socialist collectivism to its limits. As collectivism implies that human beings are social animals, better suited to working together for the common good than to striving for individual betterment, the natural and proper relationship between them is one of sympathy, affection and harmony. Order and social stability therefore arise spontaneously ‘from below’; they do not need to be imposed ‘from above’ by law, government and the state. The state is therefore unnecessary and, because it imposes ‘political’ order rather than ‘natural’ order, it is also evil. To what extent have socialists favoured the common ownership of wealth? Socialism has traditionally been associated with the goal of the common ownership of wealth. However, the extent to which this is true varies in different forms of socialism. Fundamentalist socialists practise the ‘politics of ownership’, in the sense that they are profoundly critical of private property and their model of socialism is grounded in a belief in common ownership. They criticise private property because it is unjust, because it breeds acquisitiveness and so is morally corrupting, and because it fosters conflict in society, particularly between property owners and the propertyless. This has encouraged fundamentalist socialists such as Marxists, to call for the abolition of private property, common ownership having the advantage that it ensures fairness (through, potentially, absolute social equality) and fosters fraternity and social solidarity. Such thinking clearly influenced twentieth-century communists, encouraging them to construct centrally planned economies based on state collectivisation. However, revisionist socialists or social democrats have placed much less emphasis on common ownership. Where they have supported common ownership it has been in the more limited and specific form of nationalisation, usually focused on the so-called ‘commanding heights’ of the economy (major industries such as coal, steel, electricity and gas). This led to the construction of mixed economies rather than state collectivisation. Moreover, social democrats increasingly distance themselves from the ‘politics of ownership’, embracing instead the ‘politics of social justice’, in which socialism is defined by the narrowing of social inequality within a still largely privately-owned economy. So-called neo-revisionists since the 1980s have taken this trend even further, at times supporting privatisation and regarding questions of ownership as of no significance. Explain the key ideas associated with revisionist socialism. The revisionist stance is based on the recognition that capitalism has advantages that alternative economic systems may not be able to rival, notably an unrivalled ability to generate wealth. Revisionist socialism defines socialism in terms of equality (or at least reducing material inequality), practicing the politics of social justice rather than the politics of ownership. The mechanisms through which social justice (and therefore socialism) can be advanced include the mixed economy, economic management and, above all, comprehensive social welfare. Why did Marx believe that capitalism is doomed to collapse, and how did he think this collapse would occur? Marx believed that historical change is brought about through a dialectical process involving fundamental contradictions that eventually lead to the collapse of each class society. In the case of capitalism, these contradictions are rooted in the phenomenon of private property and result in irreconcilable class conflict between the bourgeoisie and the proletariat, the former being a ruling class that exploits and oppresses the latter. For Marx, the collapse of capitalism would come about though a proletarian revolution, which would occur as the proletariat gained revolutionary class consciousness, and so acquired an accurate understanding of the exploitative nature of the capitalist system. This would occur through the immiseration of the proletariat, a product of capitalism’s the deepening crises of over-production.